Discussion in 'Pit Buzz' started by MaineAlkyFan, Jul 30, 2017. New England Dragway is our home track. Home is really close for some of us, like Keith, who lives about a half hour from the track, but quite the haul for Dave, who had a 15 hour drive up from his new house in South Carolina. We had a full crew at New England, Dave & Keith shared the top of the engine servicing, Cora & Kevin did the clutch & I did the oil, fuel & assisted Dave with the bottom end servicing. By mid-morning Thursday we were all set up, pitted with Lebanon Valley winner Josh Hart to our left & Canadian Dan Mercier to our right. As advertised, it was hot & muggy. We were planning on taking advantage of the open track test session between 1-6PM to get in some test runs. The only thing that ended up being tested was the level of greed. After spending over $600 in entry fees, we were informed that in addition to the expected $75 fee for testing, we would also be charged an additional $20 for each crew member. Fred made a decision of principle, and testing was off the table. I was not immune to greed either... 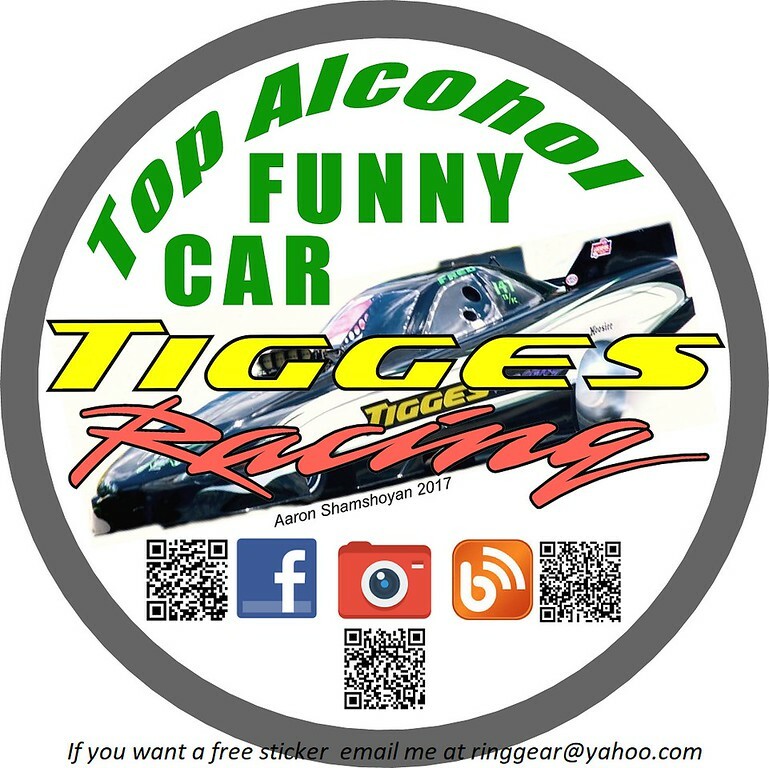 I had purchased promo stickers to give out at the track, and I asked Cora to make up a little sign to try to recoup the cost of the printing. Fred reminded me that that just wasn't right and off came the sign. It did feel pretty good to give them away, we gave out over 100 of them. We spent the day complaining about the heat & fixing one of the rear body mounts that had been damaged during the trip up from the shop. Did I mention it was hot? Work has been really busy, and between the race preparation & long work days we were all pretty tired. I drank a gallon of water between 11AM & 4PM. The teams that did test were getting hit or miss results. Lots of shaking & shut-offs going on out on the track. It was good to see the McPhillips guys run a 5.31 at 272, they have been in need of some better performance. Kevin & Jill arrived Friday morning to weather that was still hot, but less muggy. We headed up for the first round of qualifying just after 1PM. We were one of three cars to make it down the hot track, which had had the sun beating down on it all day. Our 5.69 at 256 was the best we had run with the new chassis, but less than we expected. It landed us in the second qualifying position. We had normal service during a slow afternoon, then headed back up for Q2 just after 6PM to a right lane with a bare spot about 100 feet out. The car just acted stupid, Fred pedaled it early then it tossed the belt, something I have never seen happen in the four years I've been with the team. As Mark would say, 'something ain't right'. After consulting the alien knowledge infuser & the computer graphs, the spark plugs we ran in Lebanon Valley were tested. Sure enough, plug #6 was open circuit. The plug looked fine, with good color & no cracks. The power being supplied to the plug was 'double jumping' the open circuit, causing the firing event in the cylinder to occur later than it should have. This problem was hidden in the 'new car' assumptions. The net result was all the runs at Lebanon Valley were down 300 or so horsepower & all the data we gained there was more or less unusable. With the new plugs we installed for New England Dragway, our clutch tuning decisions were all wrong. We buttoned up the normal service items then headed over to the lobster-fest put on for the alcohol racers by Arthur Gallant, Dan Page & John Finke, thanks guys! I went to bed with the revolving question in my head... if we are down 300 HP, why is the car asking for more clutch? I woke up Saturday morning at 5:09 with the same question on the brain. It didn't make sense... less available power should equate to the car asking for less clutch, not more. Mark came out with coffee & I asked him, figuring there must be some logical explanation. His answer 'It's what they do. I've been trying to figure it out for years.' I'm beginning to understand why it is so difficult to get a win with one of these cars. Our best guess at getting down the track in the last qualifying session at 11AM was a bad one, leading to us being bumped down to the third qualified position for the first round of eliminations at 5PM. With the long afternoon, we replaced to rod bearings, put in a tune-up to try to balance the power to the clutch & started over. Round 1 of eliminations started a little late at 5:30, and we provided the best funny car race of the weekend for the fans, beating Matt Gill to the stripe by a mere 19 inches, our 5.67 besting his 5.69. The win was invigorating, & the mood in the pit was jovial. Jim Libby had been visiting throughout the weekend and asked about the color of the fresh oil I was putting into the oil tank. Cora, holding the funnel smirked in Jim's direction saying 'It's the blood of our enemies...' she also was pretty excited that the french fry receipt she got from concessions was order #147, our car number. We had a speedy service & were back at the starting line just after 7PM to what looked like a win with a nice straight pass, but the win light came on in the other lane. We still have details to figure out. Back at the pit it was all business, putting everything but the car & awning away to prepare for an early exit the next morning. Pit mate Josh Hart took the TAD win on a psychic holeshot & Burkart took the TAFC win with the only run in the 5.50's all weekend. Our only consolation was we still hold the track record at 5.55. So off we go to the Atco, New Jersey Regional the first weekend of August, sure to be another steamer. The plan is to drive the baseline silly, then start tickling the power up. We have already made 9 passes this season, four of which were round wins. Those details are way better than our 'not a single round win' 2015 season.